Grandparents Day is dedicated to honoring the relationships between Goshen College students and their grandparents and recognizes the influence that grandparents have on a younger generation. Through a campus visit, the day also provides the grandparents an opportunity to get a taste of their grandchild’s college experience. 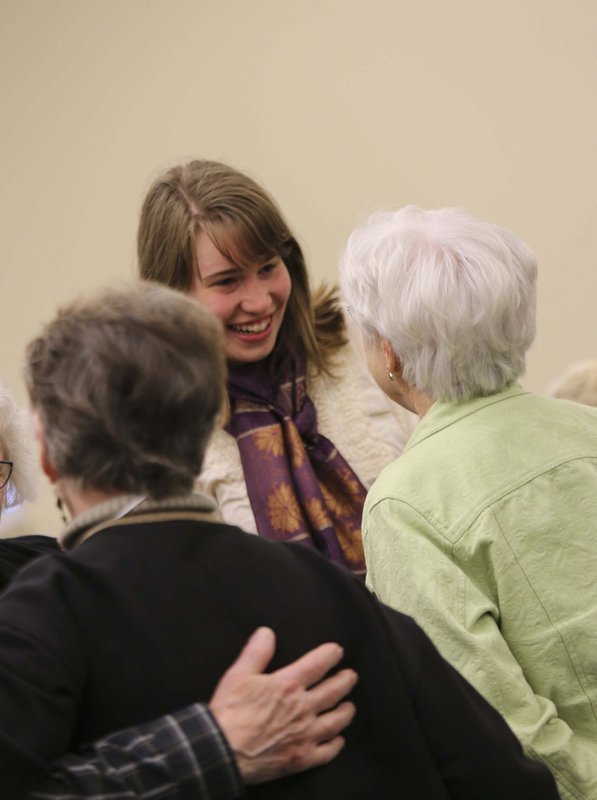 Our hope is that grandparents will see for themselves the great things happening at Goshen College. Please note: the campus visit is also open to other senior adults who fill a grandparent role for a current student. A full day is planned for grandparents including a reception with President Brenneman, time to attend a class, have lunch with their grandchild and other optional activities. $15 per person for Friday campus events including breakfast and lunch. Register online, or call 574-535-7564 to register by phone by October 29, 2015. Please park south of the Church-Chapel and enter through the south doors. Check in at the table and pick up your name tag and tickets. Following check-in, this is a good time and place to meet your grandchild before joining them for chapel. Join your grandchild and the campus community in worship. Meet President Jim Brenneman, and be sure to have your photo taken with the president and your grandchild! Come and go if you wish to join your grandchild for their 11 a.m. class. You may choose to attend a class with your grandchild during this time. Please discuss this option with them ahead of time. As a courtesy to professors and to ensure there is room for visitors, your grandchild will need to speak with his or her professor about your classroom visit before Grandparents Day. Join up with one of our student ambassadors for a walking tour of campus. Choose a 50 minute comprehensive tour, or a shortened 30 minute tour (excludes Recreation-Fitness Center and Music Center). Tours leave the Welcome Center at 1, 1:30, 2 and 2:30 p.m. Need a lift for the tour? Request a golf cart ride on the registration form. This presentation will focus on the work being done by the intercultural team at the Center for Intercultural and International Education. Learn how the intercultural team is creating spaces for discussions across differences. Stories will be shared of how community engagement with the Latino, African American and Asian American is opening doors for further diversifying Goshen College, and why this is important. What happens when college students and prison inmates come together to learn from and with each other in a classroom deep inside a large correctional facility? Come learn about GC’s very successful implementation of the “Inside Out Prison Exchange Program” from co-instructors, Schrock-Shenk and Gilbert, and hear how the program has grown. Springer will introduce some of the treasures in GC’s Mennonite Historical Library, including several rare texts. Discover the resources available to you for researching your own regional and family history. Get a behind-the-scenes look at the hands-on opportunities available for students in the Communication Department. Hear about award-winning programs in The Globe radio and The Correspondent television news. See some projects by FiveCore Media, the GC video production company, and hear about the connections made with the city of Goshen. And if you’re up to climbing the stairs, watch a WGCS, 91.1 The Globe student deejay in action. Join the student-led GC Hymn Club in a rousing hymn sing. Listeners as well as singers are welcome. This exhibit shows how the Doctrine of Discovery legalized the theft of land, labor and resources from indigenous peoples. Paintings on canvas and paper by 1994 GC alumna. Pick up brochure at morning check-in. More than textbooks. Come on in and browse. Be sure to check out the Goshen College grandparent t-shirts! Open 7:30 a.m. – 4:30 p.m. and 7:30 – 11 p.m.
Come relax at Java Junction for a hot cup of coffee/tea and snack. This is also a good place to meet up with your grandchild. Want to spend more time with your grandchild? Meals can be purchased at the dining hall during dinner hours. Cash or credit card only ($9.05 plus tax). Or, your grandchild may prefer going out to dinner and taking in First Fridays, a popular community event in downtown Goshen. Ask them! No charge when you pre-register; pick up tickets at morning check-in. Volleyball, women’s and men’s soccer may be in conference tournament play; time and place to be announced. Make your lodging reservations by Oct. 22, when rooms will be released to the public. Please discuss your plans with your student/grandchild AHEAD OF TIME, since some students’ schedules might limit the amount of time they can spend with you. $15 per person for Friday campus events including breakfast and lunch. Click here to register online, or call 574-535-7564 to register by phone by October 29.